World of Warcraft is a game made by Blizzard Entertainment that currently has around 11 million players worldwide. If the denizens of Azeroth were their own country, they would actually be more populous than many real countries, including Greece. So what is so amazing about this game that millions upon millions of players spend time and money to constantly 'live' in its virtual confines? 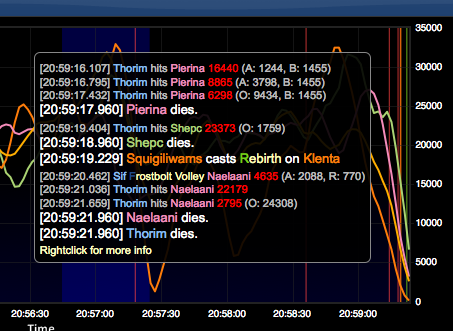 It could be the the story, it could be the interaction (the game is entirely online, played with other real people). It could be the challenging 'end game' raids where you and multiple friends take on huge dragons and demons. Actually, for Me and my coworker Mabelyn, its the numbers. On top of the big virtual world and 3D graphics that take up gigabtyes of space on your computer and huge amounts of power to render and build is just a simple list of who does what to whom. Funny enough, this is where it all gets good. The best players obsess over their numbers down to single percentages of improvemnt, because their numbers are the true measure of perfomance. Each character in the game can equip pieces of armor that imbue certain stats. There are thousands of pieces of armor, with probably 20 different stats that have various effects on play. With all these numbers, how does one know what is best for them? With all this gear, how do I select pieces to quest for and hunt down? Interstingly enough, the game itself only provides the basic information (What Am i Wearing?). Its up to the players to figure out what all that means for the big picture. Here come the web developers to the rescue! Gamers independent of Blizzard have been using web technologies for years to catalog and discuss the massive amounts of data in this game. Need general information on a quest or an NPC (non player character, one of the computer controlled in game people) or a zone of the world? www.wowwiki.com has your answers. 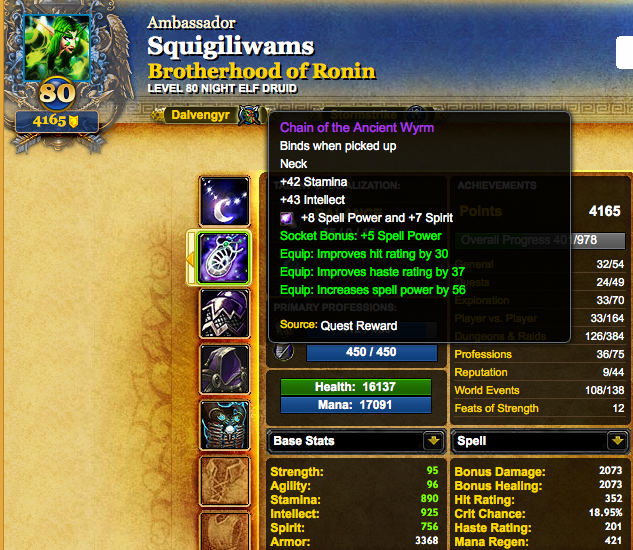 Want to find a piece of gear in the game and compare its attributes to your own gear? www.wowhead.com is a giant database of all the thousands of items in the game. So how do Mabe and I improve our performance? We deal in all things Web, so of course we use the online tools available. 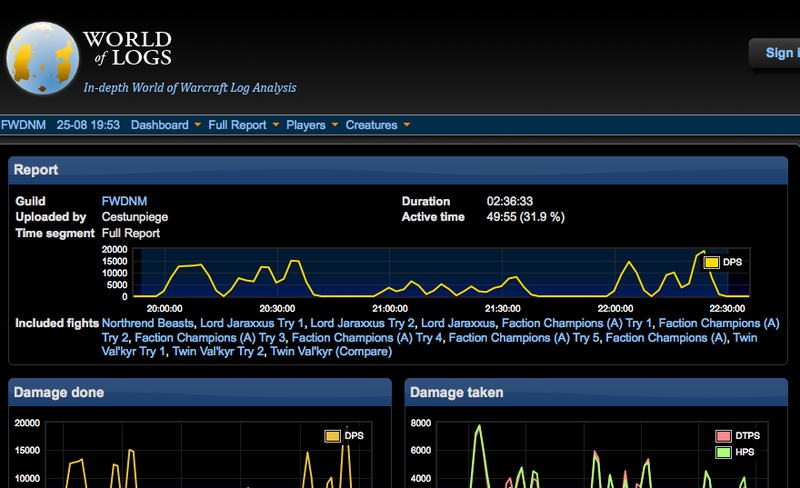 There are many sites now that will take your 'combat log' (like the example above) and parse through the thousands of lines of data, from gaming sessions somtimes 3 or 4 hours long. When you can generate 30 or 40 lines of combat log data in 1 to 3 SECONDS of play, you quickly get into datasets that are nearly impossible to study by hand. So we use sites like World of Logs and WoW Web Stats to store and parse our data and then we can share it with each other and compare our own performance over time (That new helmet incrased my performance by 3 percent!). Just like the solutions that RustyBrick builds for our client's businesses, these sites showcase the best of the web's technologies. Who knows, some of these products are complex enough to be sources of revenue like our professional sites. They surely have a large enough group of people to sell to! Wesley joined RB after graduating from the Rochester Institute of Technology with a BS in Information Technology. In addition to building web solutions, he also assists in iPhone development.